China’s growing economic importance is hardly news, but still certain economic milestones do serve to highlight the shifts underway in the global economy. 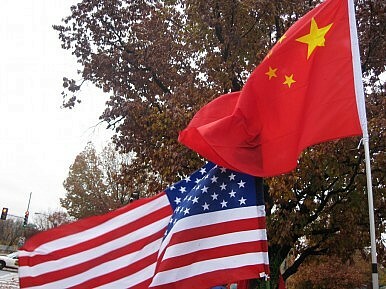 According to statistics from both China and the United States, 2012 saw China’s total goods trade surpass that of the United States for the first time. The stats from the U.S. Commerce Department show that the U.S. total trade in goods (exports and imports of goods) totalled USD$3.82 trillion in 2012. China Customs, who publish the equivalent data for the country, recorded China’s total trade in goods at USD$3.87 trillion, marking the first year in the modern era that China’s total goods trade surpassed that of the U.S. There are a couple of things to keep in mind when considering these statistics. For one thing, trade in goods is not equivalent to total trade. A further category of trade is that in services, where the U.S. has an advantage due to its more advanced stage of economic development. In fact in 2012, U.S. total trade (including goods and services) was recorded at USD$4.93 trillion – the country recorded a trade surplus in services whilst recording a much larger deficit in the goods sector. Another issue which distorts trade statistics is that of illicit fund outflows from China. Such outflows usually occur as a result of crimes such as corruption and tax evasion, in which China’s wealthy and well-connected elite are believed to excel. Moving funds offshore decreases chances of detection, and given the incoming leadership’s focus on graft and corruption, it is understandable that such practices could have increased in recent months. Even income equality policies are bound to encourage the wealthy and illicitly wealthy to move their money offshore. Global Financial Integrity, a non-profit, monitors and reports extensively on illegal money flows, and has been drawing attention to flows out of China for years. One method of moving funds illicitly is by “misinvoicing” exports and imports to disguise flows of funds. A report published in October 2012 states that “The deliberate misinvoicing of exports and imports comprise by far the major channel for the transfer of illicit capital from China.” Such misinvoicing distorts trade statistics by understating exports or overstating imports. To put this figure in focus, China’s local media quoted the country’s anti-graft body as putting the total for illicit outflows from China in 2012 as a massive USD$1 trillion, and this was on top of an estimated illicit outflows of USD3.79 trillion between 2000 and 2011. So, comparing China and U.S. goods trade is a bit like comparing apples and dragon fruit, and it is quite natural that the U.S. services sector should be larger and more significant that China’s. Furthermore, if we take into account the size of distortions that China’s illicit capital flight may have on its trade statistics, we can’t even be certain of China’s trade total anyway.